My mother had a visceral relationship with pastry that I was close to inheriting. For her, learning to cook was a prerequisite for marriage dictated by my father, alongside learning to play bridge and tennis. For my mother, pastry lay too far from her cooking comfort zone, a narrow area stretched between pouring a bowl of cornflakes (for breakfast lunch and dinner) and anything to do with eggs (she made excellent soufflés (?!) and, being a New Zealander, huge great pavlovas – the size you have to buy a new platter for). To be fair, this was at the beginning of my parent’s relationship and mum did acquire a broad cooking repertoire in time (and played both bridge and tennis), but pastry conquered her; she never left the kitchen after a pastry attempt with pastry or an in tact temper. Forewarned about the perils of pastry making, I duly avoided any attempt until I lived on my own and decided I might handle the inevitable defeat better by myself and without the added pressure of a husband and children happy to critique the result [wife edits: this is before acquiring my own live in connoisseurs]. And so there I was, in a tiny kitchen shared between five housemates, cutting chilled butter with two knives into white flour, carefully adding ice water, and using the tips of my fingers to gently form a ball of finished dough. 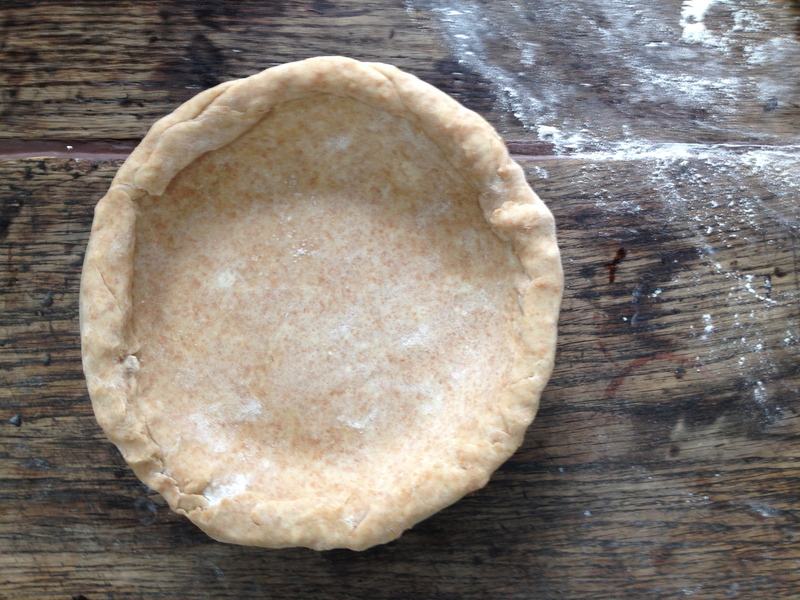 The resulting pie (after a brief frustration of rolling the dough) was encased in a delightfully successful crust. It hadn’t been difficult at all! And with the success of pastry came the dawning realization that if I could conquer pastry then really I could cook anything. First a pie; next, pheasant under glass! 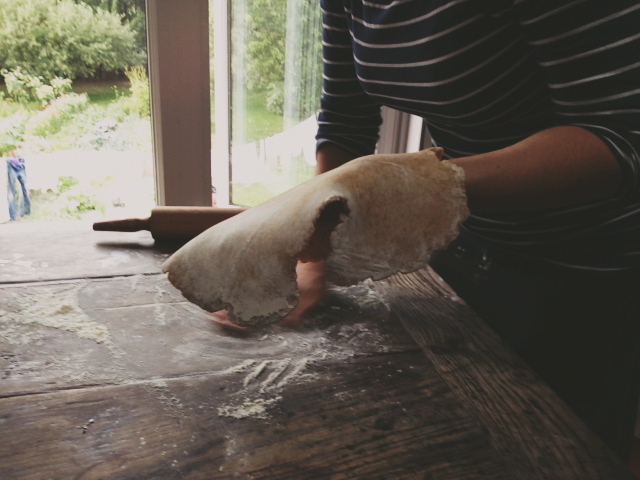 Fast forward a frightening number of years to present day and pastry remains my personal bedrock in the kitchen. I turn to it in times of need, kind of like religion [gearhead edits: don’t go there]. The weekend was filled with those extra unforeseen tasks that make it so frustratingly impossible to get anything done: spilled milk on the floor I wasn’t planning to wash; the newly adopted dog going into heat [wife edits: and having to change its diaper – good grief what a nightmare! ]; a small vessel inexplicably blowing up to spray glass shards with remarkable accuracy to all four corners of the kitchen [wife edits: dog and barefooted children out of the kitchen!]. Pastry making, dear readers, with its methodical preparation requiring focus and a hefty dose of determination [wife edits: I will get something accomplished today!!] delivers the small win when one desires it most. Rolling out pastry dough one can experience a brief but powerful Zen moment amidst the chaos that is family life. This all butter version with the wholesome (and toothsome) addition of spelt is delicious. So good in fact I had to shoo one of the kids away after removing two quiches from the oven, they were so adept at removing the crust as the quiche sat cooling before dinner. [Gearhead edits: gearheads don’t eat quiche] [wife edits: scathing indifference]. This recipe is adapted from the Rombauer and Becker The Joy of Cooking. Makes two 23 centimeter/9 inch pie crusts. Place flours and salt in a bowl (or the bowl of a food processor) and mix with a whisk (or pulse) to combine. Scatter the chilled butter pieces atop the flour and cut the butter into the flour either using a pastry blender or two knives (or alternatively, pulse the food processor a few times) until the butter pieces are the size of small peas (and smaller) and evenly distributed like crumbs through the flour. The mixture should be dry and powdery, not greasy. (If using a food processor, with the machine running) drizzle 1/3 cup ice water over the flour mixture. Mix gently until the mixture becomes evenly moistened and begins to make small balls (stop the processor). Press down on the balls and if they stick together easily then you have added enough water; if they do not, add a tablespoon of water at a time, mixing well after each addition, until the dough holds together. The dough should look rough, not smooth. 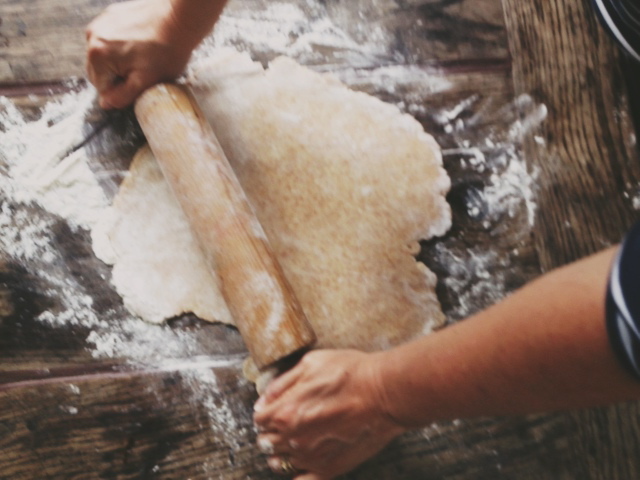 Divide the dough in half, press each half into a round disk, and wrap tightly in plastic wrap or aluminum foil. Refrigerate for at least a half hour, preferably two hours, and up to two days before rolling. 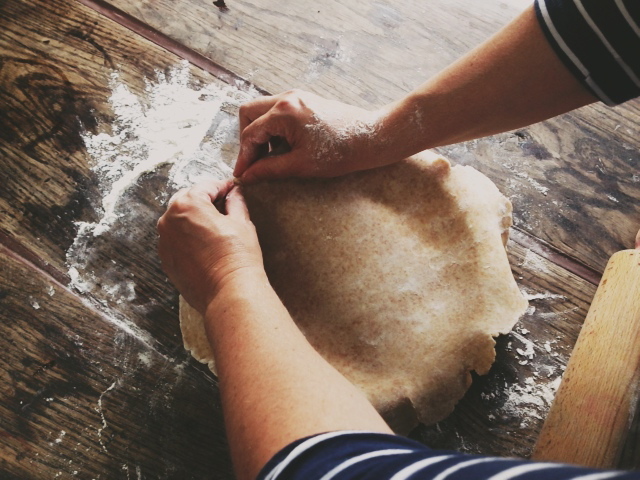 The dough can also be wrapped airtight and frozen for up to 6 months; thaw completely before rolling. 14 Aug	This entry was published on August 14, 2013 at 6:44 am. It’s filed under Uncategorized and tagged Butter, cooking, Dough, Flour, Food processor, Home, Pastry, Pastry blender, spelt. Bookmark the permalink. Follow any comments here with the RSS feed for this post. I cannot wait to try this fir quiche. Have you used this recipe for fruit pies? 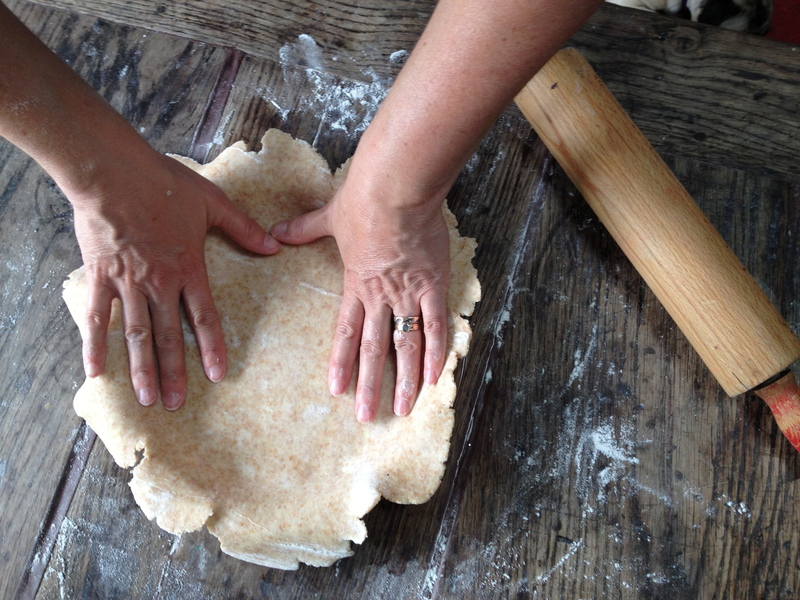 By the way…I feel the same way about pastry making…my mom was a great teacher and I never felt intimidated by pastry at all. Her motto was…”If you can read you can cook…”. Everything in the cookbook was fair game..because nothing seemed impossible…:). Hi Jenn. I have not tried with sweet fillings but I think if you added a teaspoon of sugar along with the salt it would work just as well. The crust is quite nut-like in flavour so a filling that plays that up would be great.